Post pics of your TV! Discussion in 'Picture Gallery' started by .macbookpro., Jul 26, 2014. So I just got a new TV - The LG 49UB850V- and I wanted to see what other people had. I will post a stock photo, as the TV is currently shrouded in some dust sheets and I'm not in the country, but when I get back I will post an actual picture. 49 inch, 4K 3D WebOS Smart TV with HEVC and HDMI 2.0 port(s). Also, came with a free LG G Pad 8.3. I have a 55" Samsung 7900 that I enjoy. My father just went out and bought this bad boy....I call dibs when hes done with it. He has the 65" version. With a stand and warranty it cost him almost $10,000. Wow, $10,000. Mine came with a free 5 year guarantee and stand. Didn't think they sold TVs without stands these days? Got a matching LG sound bar as well. Only 3cm tall, but sounds terrific. It's getting wall mounted, right below the TV. We only buy LG for our main TV. Had an old 720p TV for about 6 years now, and it didn't miss a beat. Also,we only buy from richer sounds. Great service, free lollipops and free 5 year warranty. I've had this TV for 3 years and love it. Mother of god those lanterns would infuriate me and promptly be moved. Currently got a pretty average Panasonic AS740 from a warranty replacement, but waiting for LG's 4k OLED to become sensibly priced. TV is a Sony 65W850. I won't be getting on the 4k bandwagon until signal processing delays during up-scaling are reduced. The 4k set that was this one's big brother had horrendous input lag on 1080p games. 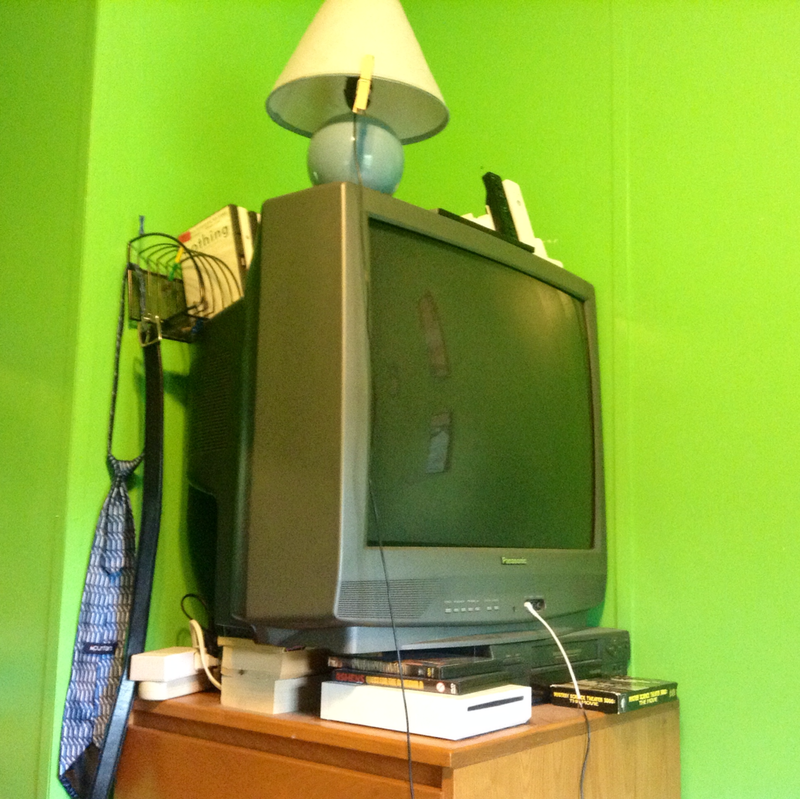 I don't have a TV... I have this instead. Did it all by myself. digitalnicotine, Silverjerk and Renzatic like this. Nothing special. 60" Samsung supported by a TiVo & ATV. have a panasonic 2006 720p 50 inch plasma that costed me 3grand forever now. not much can justify buying a new tv untill the lg 4k oled panels come down to about $2000. ive tried buying new tv's over the last decade and it all looks the same from about 5 feet away. the black levels on my 2006 are better than like 90% of lcd but those new oleds are perfect black and the color is amazing.